Some of you who regularly read this blog will recall my recent outing with Patrick after which I surmised that New Jersey birders coming to bird in New York were cursed. You may also recall that in that same post I mentioned that we would have a chance to break the dreaded Jersey Curse in the near future, when a bunch of bird bloggers were going to gather at Jamaica Bay to see shorebirds. Well, that day came, it was yesterday, Patrick, afraid of the rain, canceled, other New Jersey residents showed and, well, the rain stopped just before we started birding and the rest of the day looked like this! The Jersey Curse has been broken and The Patrick Belardo Curse is just getting started! But I get ahead of myself with mentioning the day’s weather. To appreciate the weather I firs had to get to Jamaica Bay which I did by walking across Forest Park in the drizzlymist and then catch the Q53 to Jamaica Bay. I arrived at about 7:30, half an hour before we bird bloggers were scheduled to meet, and was amazed at the sheer number of birders already there. Apparently, not only were we bird bloggers meeting up, but The Linnaean Society had a scheduled shorebird walk, the New York State Young Birders Club was on a field trip, and a rumored fourth group whose name I never learned was also present at the preserve. It was great to see so many birders (and the 30+ Chimney Swifts that went by overhead, the most, by far, that I had ever seen at Jamaica Bay)! It was even greater when the rest of the bird bloggers showed. Carrie of Great Auk – or Greatest Auk? was the first, followed by Christopher of Picus Blog and Birding Bev of Behind the Bins, and then Anne Marie, who tweets as iheartwarblers. Rounding out our crew were Catherine of Birdspot, Cindy from Living in Brooklyn – Longing for Maine, Scott from Peace, Caffeine, Linux, Laura from Somewhere in NJ, and Jay from birdJam. Our motley crew gathered at the visitor center and then regathered at the most convenient lot to access the north end of the East Pond, which we decided we wanted to visit first in case the rain did not hold off for long. Why did we want to visit the north end of the East Pond first? Because of recent reports like this and this (on that second link make sure to watch the phalarope video). 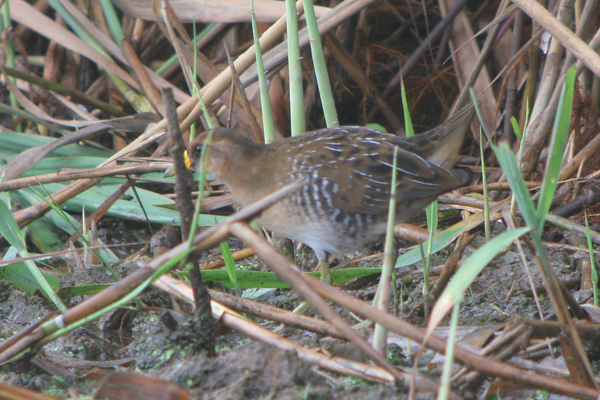 Though we were eager to see the Marbled Godwit, American Golden Plover, Wilson’s Phalaropes, and American Avocet that had been reported of late none of us complained in the least when we got to watch a confiding Sora, normally an elusive rail, wander the edge of the reeds. Of course, by that point we had already seen all three of the Wilson’s Phalaropes and a host of other shorebirds too. 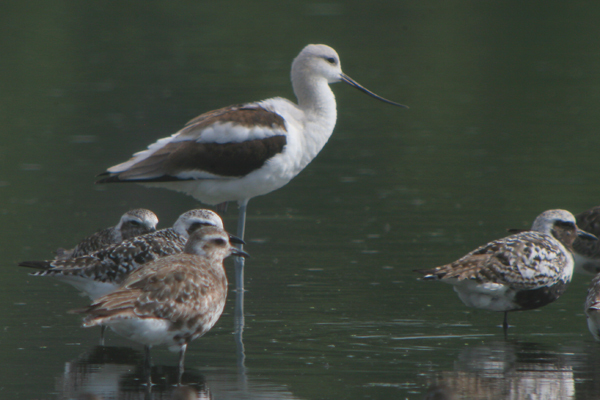 The American Avocet, my first in New York State since September of 2007 (also sighted on the East Pond) was visible already as well, though distant, and it would only be a matter of time before one of the many searching birders we joined would spot the godwit and the plover. No one found the godwit or the plover during the hours we spent on the East Pond. But we did see plenty of other good birds! It was fun being on the East Pond, watching folks new to the pond adjust to the most disgusting mud in the world, seeing great birds, and feeling like part of a community of like-minded people. And when the excitement of an odd bird started it was easy to join in the speculation and help raise the level of excitement, even though it turned out to be a regular bird in a plumage most of us weren’t used to seeing: a juvenile Ruddy Turnstone (Doh! Well, you learn something new every day…). Can you name all the shorebirds with the juvenile Ruddy Turnstone? Eventually though, we grew tired of the shorebirds and decided to make moves to the West Pond. So once we removed our mucky boots and washed them off and refreshed ourselves with Bev’s delicious muffins and water that she thoughtfully brought we headed back to the visitor center and started birding some more. 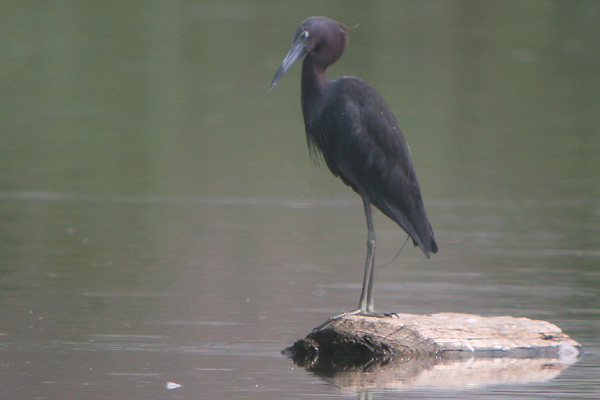 One of the few highlights of our walk around the West Pond was the juvenile Little Blue Heron below, which, of course, looked nothing like the adult Little Blue Heron we had seen on the East Pond, a photograph of which is also below. Other birds we spotted on our West Pond wander included Northern Shovelers, Blue-winged Teal, Tricolored Heron, Peregrine Falcon, and some Brant. All nice birds, but nothing amazing. After our West Pond stroll it was time for a food break, and half of us ended up at a clam shack and the other half of us ended up at the diner. I was one who ended up at the diner and was I ever stuffed by the time we walked out of there! Back to Jamaica Bay we went, a couple of birders fewer, but no less enthusiastic. The south end of the East Pond held few birds at all, but I was surprised that there were still Mallard ducklings around: I thought that they would all have been fully grown by late August. Also interesting at the south end of the East Pond was an uncountable bird, an escaped or released Black Swan, a bird that is normally found in Australia. If it was actually a wild bird and if it had actually flown to Jamaica Bay, New York, under its own power it would most likely be considered a Black Swan Event, at least within North America’s birding community! However it got here it is a very striking species. From there we went and took a look at Big John’s Pond, where a young Yellow-crowned Night Heron posed nicely for us directly in front of the blind. Once we got back to the visitor center again we discovered that the Marbled Godwit had been seen earlier on the West Pond, so some few of us went and tried to find it but it had taken advantage of the now-low tide and flown elsewhere…once we discovered this we called it a day and headed home. It was a heck of a day’s birding with great birds and cool people. Thanks to Birding Bev for getting the day together! I had a great time!!! Well except for the scary black ooze that tried to swallow me whole. What say you to Sandy Hook or Hawk Mountain next? Oh man, that looks awesome. I’m going to try to get down that way in the next two weeks and get my shorebird fix. Funnily enough, I too just saw a wayward Avocet (@ Montezuma), only my second ever. @Nick: It was seriously awesome. And congrats on the avocet! I so wish I was there, if only because I fear the Belardo curse has rendered me birdless. 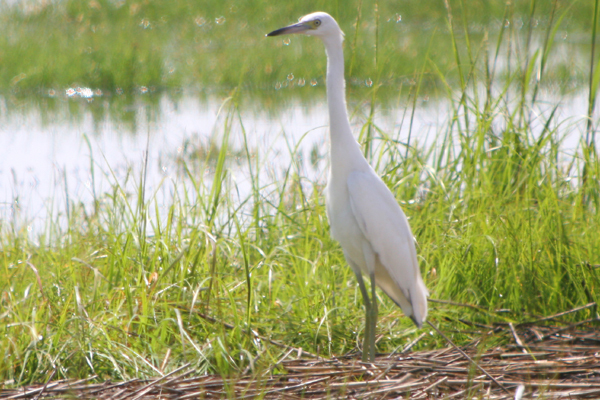 It was a great day (if not a little hot and humid) of birding. I loved the Avocet, Thanks Corey for guiding us around and Bev for organizing. It was great for me to have seen the immature black-crowned night heron on the Gowanus Canal on Thursday night and then the immature yellow crowned at Jamaica bay of Sat. sob..sigh…sob sigh, and ditto Patricks .Grumble Grumble and add a massive jealous to that. Out west enjoying the big sky..but sure would have loved to be there with you all! Still looking for someone to event something that would enable me to be a two places at a time. So Glad you guys are continuing events..hope to join you all next summer, fall when we will be back east again. I just moved from Puerto Rico to Ithaca and I feel like a fish out of water, back to square one I guess, learning about lots of knew species, for me at least, and some familiar faces also. I saw an ebird sighting of an American Avocet in Myers Point in Tompkins county and since I was so near I made the road trip, but no American Avocet!, Ive never seen this species, I would always cross my fingers that a few would pass by Puerto Rico each season. Its tempting, but got lots of moving stuff to do and the 4 hour drive to get there maybe a little to much right know. Nice post! It was really great to meet all of you, and great write up! Alberto, you may not realize it but we’ve had an Avocet sighting much closer to Ithaca than NYC this week. 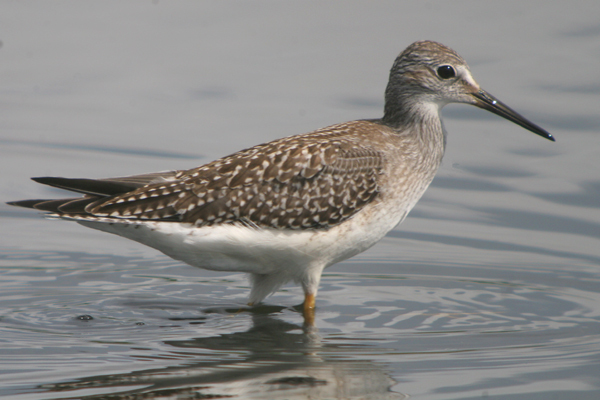 One was spotted at Montezuma NWR (btw Rochester & Syracuse) as recently as 8/23! I went to Myers Point again today after I saw the post, but no Avocet, Ill try tomorrow in the morning and see if Im lucky and he returns. Saw some Killdeers, a Black-bellied Plover and a Semipalmated Plover. The 3 Least Sandpipers that I saw yesterday were gone. I have a busy day tomorow 🙁 dont know if ill make it to Montezuma. Looks like the Black Swan has a white bill tag of the Sydney Bird Observatory, or am I mistaken? If we crop the image, maybe we can read the band’s numbers? I vote for Sandy Hook next! It was great to meet you Corey… a fun day with nice birds and that mud is something else! BTW, I have three black swans in the lake across from me… neat birds… all have that white stripe on their bills, I think. Laura, you see the Sydney Bird Observatory was really busy “banding” ALL the wild Black Swans in Australia with white bill tags, so of course everyone is thinking this would be their natural bill colouration. Great photos, Corey! I’m sorry I missed this. A great day and great write-up, Corey! I enjoyed meeting everyone and hope to be able to bird with ya’ll again soon! I’m just getting a chance to check your posting & photos. It was good to put a face to the name finally. I’m up for Sandy Hook or Hawk Mountain (never been to the latter). Thanks again to Bev for organizing, baking muffins (which were extra tasty after “warming” up in the hot car) & bringing enough water for our group & then some.